It was Robert Raikes, the founder of the Sunday School movement, who introduced a system of rewards of merit in order to maintain discipline, good behaviour and attendance at his school on Sunday. Just a hundred years ago in July 1780, Mr Raikes with the assistance of the Rev. Thomas Stock, a clergyman in the city, opened his first school in Gloucester. So he first persuaded a few children to go with him to church on Sundays, and afterwards to attend a school. The number of scholars increased so fast, that soon there were four large Sunday schools in Gloucester. There had been Sunday schools opened before in different parts of the country, but it was Mr Raikes who showed other people how much good was being done by these schools, and persuaded them to follow his example. Very soon, almost every church and chapel had its Sunday school. That is why we call Robert Raikes the father of Sunday schools and love and honour his memory so much. 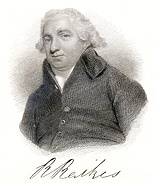 Robert Raikes born at Gloucester September 14th, 1735, he died April 5th, 1811 aged 75 years. Text from Sunday School Centenary card published by Marcus Ward & Co 1880. 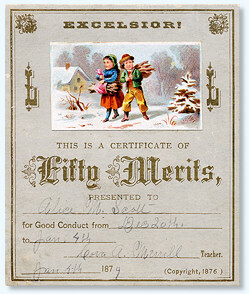 Small chromolithographed cards were a popular medium for rewards of merit in the late 19th century and were carefully pasted into scrap albums where they could be viewed at family gatherings to show the childrens accomplishments at school. The Reward of Merit was given by the teacher to a pupil for amongst other things punctual attendance, good conduct and improvement at school.